When you own a restaurant, your business plan covers a great deal of ground. You have to include property acquisition and maintenance, marketing, revenues and costs, staffing, and everything else that goes into operating a successful business. Among all the potential problems you face, though, none can devastate your restaurant faster or more thoroughly than food safety problems. The incidents that arise from a single mistake can create problems from which you may never recover. Working with a restaurant industry consultant when you’re developing your new restaurant business plan can save you headaches and sleepless nights down the road. Your plan should begin with a focus on the sources from which you obtain your ingredients. When you purchase foods for your restaurant, you need to know they’re being grown, packaged, and sent safely. This means not only knowing the people from whom you purchase, but visiting the farms and factories involved. You should include within your new restaurant business plan processes for inspection and reporting. Working with a trusted source is an important step, but verifying that the source continues to adhere to safety processes and procedures is critical. Discovering too late that you received tainted foods doesn’t absolve you of responsibility if your restaurant prepares and serves those foods. After you shore up sourcing processes, you need to include in your plan how you will ensure proper care once the food is in your restaurant. This includes both your equipment and your people. You need to include a maintenance and inspection plan for your ovens, slicers, grills, and anything else that touches the food you will serve. All equipment has to be working properly at all times to ensure food is cooked properly, and everything has to be cleaned — regularly and thoroughly — to prevent bacteria from building in your kitchen. The human element requires establishing standards for how food will be prepared. You need to know the risks involved with under-cooking certain foods, and build in safeguards to prevent those risks from materializing. You should also know and prevent the problems that arise when fresh foods are not cleaned properly. Further, your new restaurant business plan should include standards for how food will be handled. While a restaurant consultant can help with these, you should know and implement your local, state, and federal standards, and look for ways to exceed those standards. Within your plan, you should leave no room for the kinds of errors that lead to food borne illnesses in your customers. Finally, within your new restaurant business plan, you need to create standards for personal hygiene among your staff. This includes protective garments like hair nets and gloves, as well as processes like washing hands properly. You need to build in the methods you will employ and processes you will require. In addition, you should lay out the consequences for anyone found out of compliance with your standards. This not only protects you from hygiene-related food safety problems, but also protects your managers and employees by making your processes transparent to everyone who will work for you. 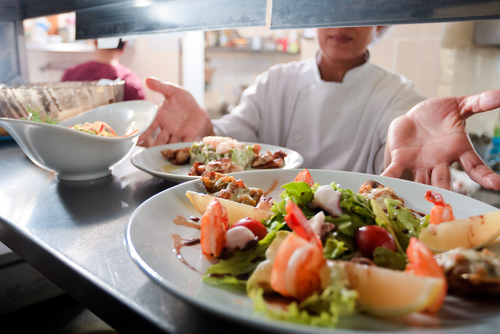 Food safety concerns hit restaurants hard; where a decorating or management mistake can slow your growth or even reverse your revenue trends, a food-related illness can shut you down entirely. Build protections into your new restaurant business plan, and follow through on everything. Your customers, your staff, and your bottom line will be healthier for it.